The body, most specifically the cardiovascular and muscular systems, experience significant metabolic demands from just one single bout of aerobic exercise. There are immediate and acute responses by the body as well as chronic adaptations, to the stresses of aerobic exercise. 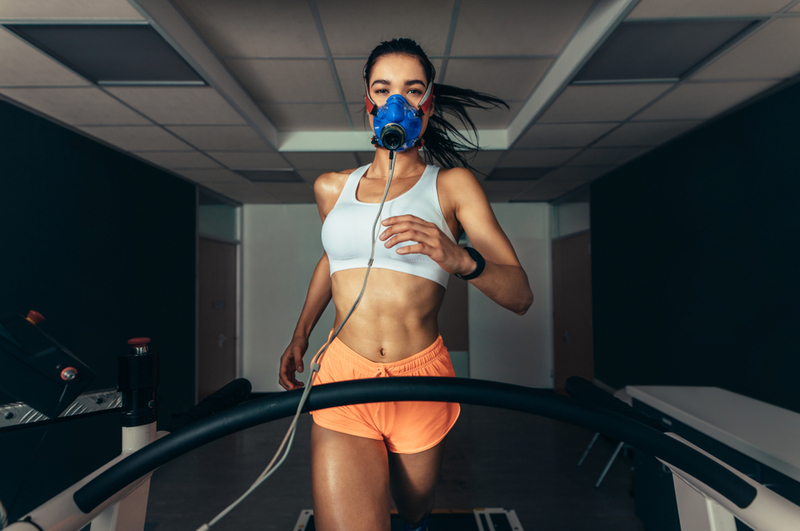 The acute responses by the cardiovascular and respiratory system are experienced in the transition between rest and the start of aerobic exercise. Immediately during the start of exercise, the cardiac output (Q) increases because of an increase in stroke volume (SV) and heart rate (HR). Cardiac output is the amount of blood pumped in liters per minute, and is the product of stroke volume and heart rate: [Q = SV x HR]. Obviously, the heart rate increases during exercise, but most people don't realize that it actually starts to pick up right before the start of exercise as a reflex. The sympathetic nervous system sends an anticipatory stimulation to get the heart ready for exercise. The stroke volume increases beginning at the onset of exercise, and similarly to heart rate, can increase with the anticipation of exercise. Stroke volume can increase up to 50% - 60% of the resting value. Oxygen uptake (VO2), which is the amount of oxygen consumed by the body's tissues, also increases to accommodate the metabolic demands. At rest, VO2 is 1 met = 3.5 mL/kg/min. The maximum value for VO2 can be anywhere between 25 - 80 mL/kg/min, depending on age and conditioning level. There is also an increase in blood pressure and blood flow. Systolic blood pressure is the pressure in the arteries during the heart's contraction, and should increase during exercise. Diastolic blood pressure is the pressure in the arteries during the rest between heart contractions, and can increase or decrease during exercise. However, diastolic blood pressure should never increase over 20 mmHg. During exercise, there is vasodilation in the active muscles, meaning the blood vessels leading to and in the active muscles dilate to allow more blood to come through and more oxygen to be transported. At the same time, there is vasoconstriction in the other organ systems as a mechanism of prioritization. Respiration also increases during aerobic exercise, obviously, to meet the new oxygen demands. Specifically, there are significant increases in the amount of oxygen delivered to the tissues, carbon dioxide returned to the lungs, and minute ventilation, which is the volume of air breathed per minute. Minute ventilation increases through an increase in breathing frequency and tidal volume, which is the amount of air inhaled and exhaled per breath. Essentially this means that you breathe deeper and faster during exercise. There is also an increase in the diffusion of oxygen from the capillaries into the tissues, as well as an increase in diffusion of carbon dioxide from the blood into the lungs. After long term aerobic training, the body adapts to become more efficient at meeting the metabolic demands. The changes to the cardiovascular system include increased maximal cardiac output (Qmax), increased stroke volume (SV), and reduced heart rate (HR) at rest and during sub maximal exercise. There is also and increase in the density of muscle fiber capillaries to support the delivery of oxygen and removal of carbon dioxide. The maximum cardiac output increases as a result of stroke volume increasing a very significant amount. The increase in stroke volume is achieved from increases in the heart's contractility, elasticity, and chamber volume, as well as an increase in the thickness of the left ventricle, which is the space that holds blood before it's pumped out into the arteries to deliver oxygen and other nutrients. Therefore, the heart can literally fill up with more blood before each beat, at both rest and during exercise. The increase in stroke volume allows resting heart rate to decrease. If the heart is pumping more blood per beat at rest, it doesn't have to pump as frequently to meet the same resting cardiac output demands. Highly conditioned athletes, for example, have resting heart rates ranging from 40-60 bpm, compared to the average person's resting heart rate of 60-100 bpm. The more advanced capillary functions ultimately allow more efficiently delivered oxygen, nutrients, and hormones, as well as an increased means for the removal of heat and metabolic byproducts. Respiratory adaptations are specific to the exercise type and upper or lower extremity involvement. If the training focuses on the lower extremities, such as running, its unlikely that you will see any adaptations during upper extremity exercises. If the athlete is training at a maximal level, then there will be an increase in breathing frequency and tidal volume, which is the volume of air displaced with each full respiratory cycle (inhale and exhale). After long-term aerobic exercise, muscle contraction becomes overall more efficient, resulting in delayed fatigue of contractile mechanisms. The build up of limiting contractile factors, lactate for example, is slower after chronic aerobic exercise compared to those less conditioned. Because there are better mechanisms for getting rid of contractile byproducts that end up slowing down muscle contractions, the neural pathways remain un-obstructed for longer. The muscles experience many changes after chronic aerobic exercise that can all be summarized as an overall increase in aerobic capacity. Aerobically trained athletes can perform at a higher percentage of their maximum aerobic power. They experience improved metabolic functions through increased fat utilization and decreased glucose utilization during exercise. This results in less byproducts that inhibit exercise performance and more time to fatigue compared to those who are less conditioned. The onset of blood lactate accumulation (OBLA) occurs at a higher percentage of aerobic capacity. The OBLA occurs at a point during exercise when the exercise intensity for the body to keep up with its lactate removal needs (think Lucy on the assembly line conveyer belt). Before this intensity is reached, the body is able to remove all lactate produced as a byproduct of metabolism and avoid early fatigue and inhibiting muscle contraction. All of these factors increase the aerobic efficiency and result in the athlete having more left over in the tank after exercise, which leads to an easier recovery. Chronic aerobic training also causes changes on a cellular level as well as changes specific to each muscle fiber type. The muscle fiber cellular changes all contribute to increased muscle efficiency: increased myoglobin levels, mitochondrial size and number, aerobic enzymes, and metabolic energy stores (ATP, PCr, glycogen, and triglycerides). Type I muscle fibers experience an increase in aerobic capacity and some might increase in size. Type II muscle fibers will experience an increase in aerobic capacity if the intensity of exercise is sufficient. There will also be less glycolytic enzymes and Type IIx will gradually convert to Type IIa, which are better equipped for aerobic exercise. While Type IIx fibers produce the most force, they're very inefficient and heavily rely on ATP and quick, low oxidative metabolisms. Type IIa fibers are known as intermediate fibers because they can use all energy systems and fatigue more slowly than Type IIx. It's possible for an athlete to experience bone growth as a result of chronic aerobic training depending on the age and training stimulus.